The Scottish National Party (SNP) has accused Prime Minister David Cameron of “watering down” new powers promised to Scotland following the independence referendum last year. 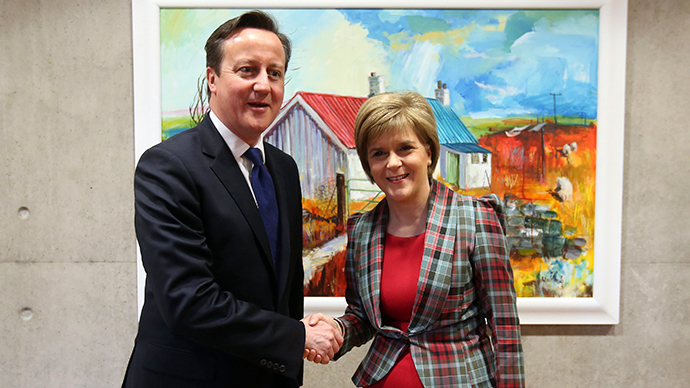 Scottish First Minister Nicola Sturgeon said ministers in London would get to veto legislation in critical areas, as Cameron unveils a draft bill to transfer power. Sturgeon said the Scottish Parliament, based in Holyrood, Edinburgh, wouldn’t be able to abolish the ‘bedroom tax’ or bring in other proposed welfare reforms. The historic bill to transfer greater power to Scotland is due to come into effect after the general election in May. It follows a “vow” made by the leaders of the three major Westminster parties to grant more powers to the Scottish Parliament. “Too much of what the prime minister has set out imposes restrictions on the recommended devolved powers and would hand a veto to UK ministers in key areas,” she said. Sturgeon added the present legislation wouldn’t allow Scotland to design a social security system which met its needs. “The legislation published today doesn’t represent the views of the Scottish Government, but it does represent some progress,” she said. Conservative leader David Cameron, Labour leader Ed Miliband and Liberal Democrat leader Nick Clegg agreed on a “process” and a “timetable” for the devolution just two days before the referendum. “Extensive new powers for the parliament will be delivered by the process and to the timetable agreed and announced by our three parties," they wrote. Speaking in Edinburgh on Thursday, Cameron said he had delivered on the promises made at the eleventh hour of Westminster’s campaign to save the Union. “Scotland spoke, we listened and now here we are delivering," he said. The new legislation is built on recommendations of the Smith Commission, which first published its proposals in October last year. Labour leader Jim Murphy welcomed the bill, but said his party wanted to go further. “I would like to see local communities and our cities have the ability to introduce new social security benefits to help people to get back into work,” he said.